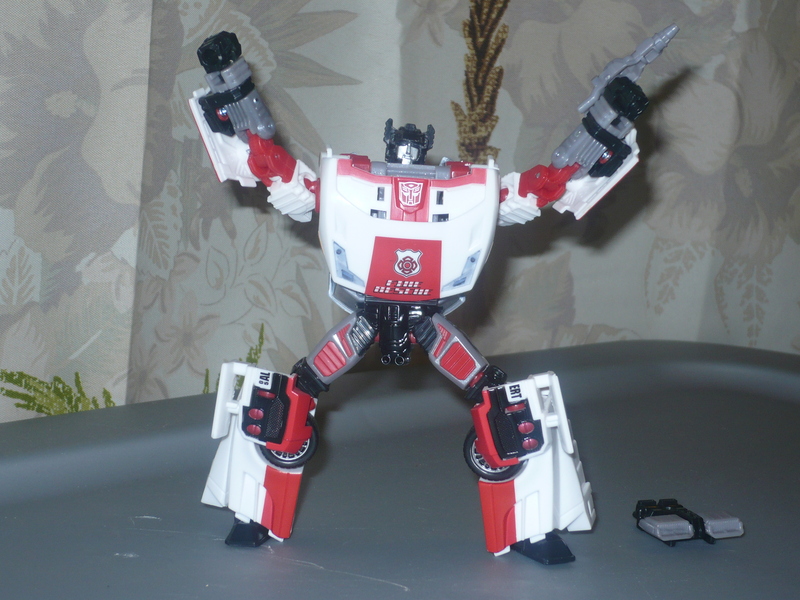 At the end of my last post, I listed 5 lines of Transformers figures, and asked which line my audience would like to see a review from. I got 3 votes from 6 comments I received. 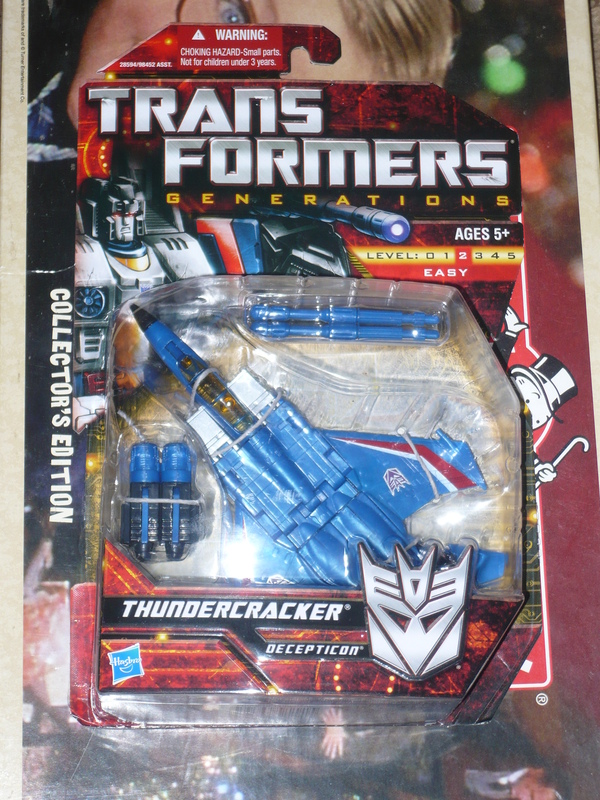 Transformers Generations was the winner with 2 votes. 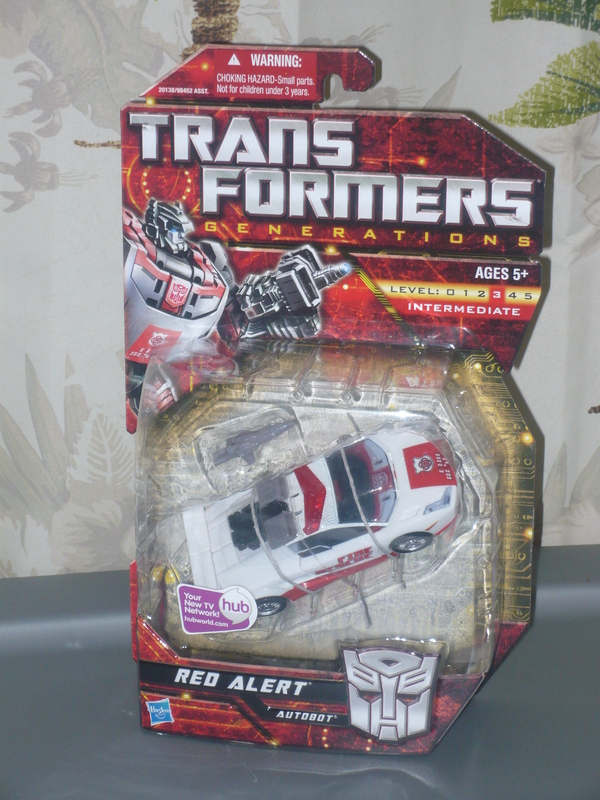 I found Red Alert here at my local Wal-Mart about 5 weeks ago. 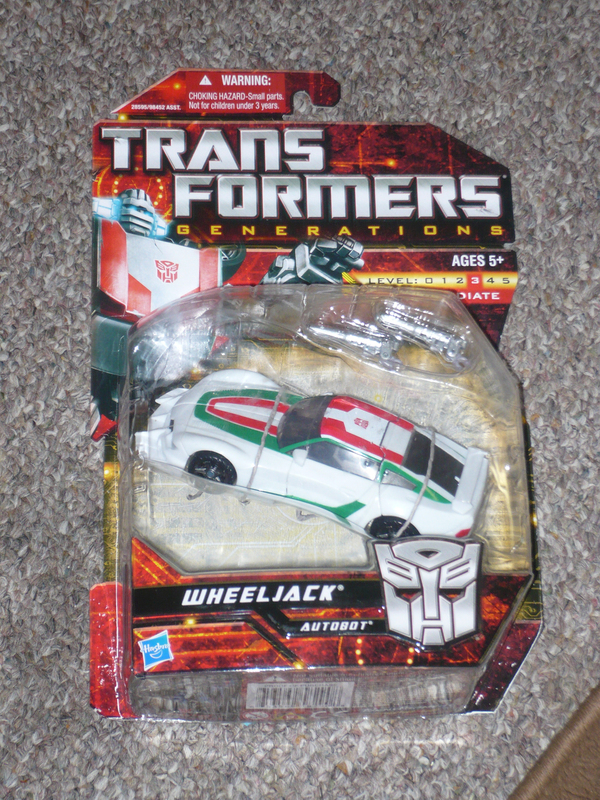 That’s kind of funny because I believe he is from the second Generations wave, and I first saw him when I was Christmas shopping last year. 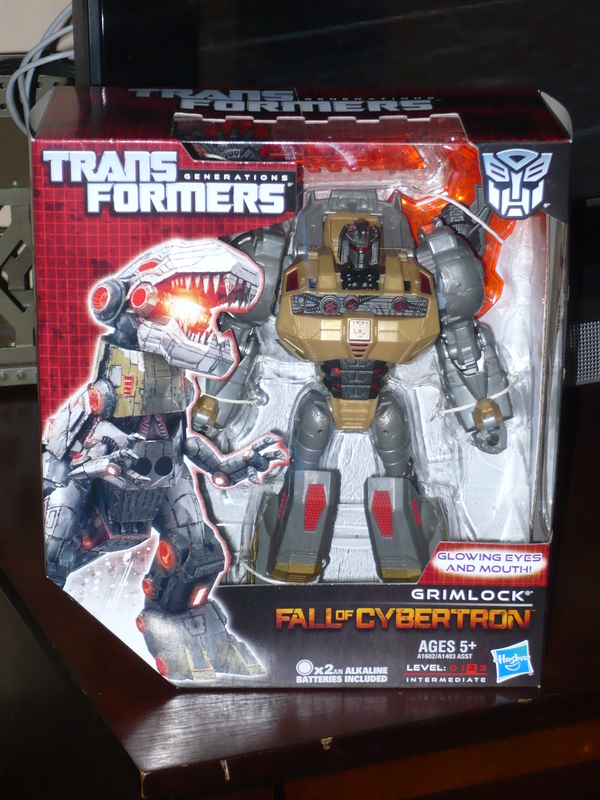 My Wal-Mart is notoriously behind when it comes to new toys. 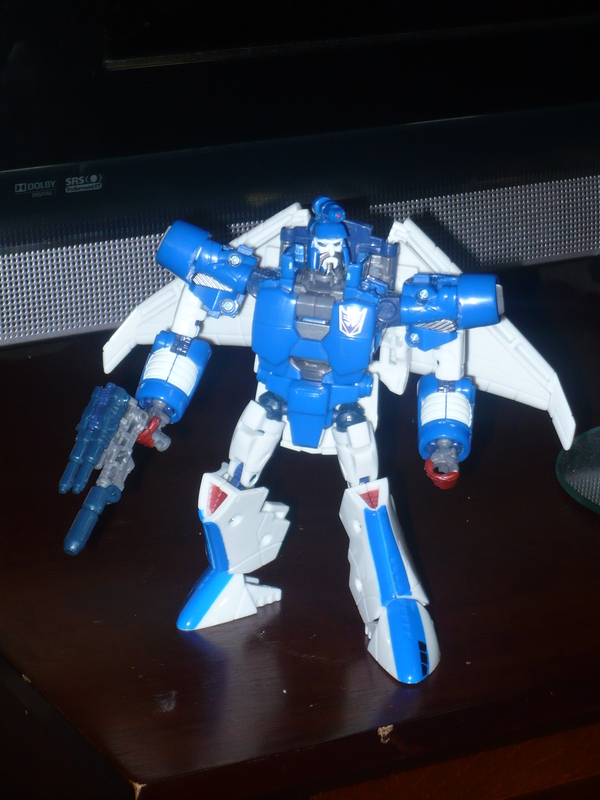 I found this figure within a week of finding Wheeljack and Thundercracker. 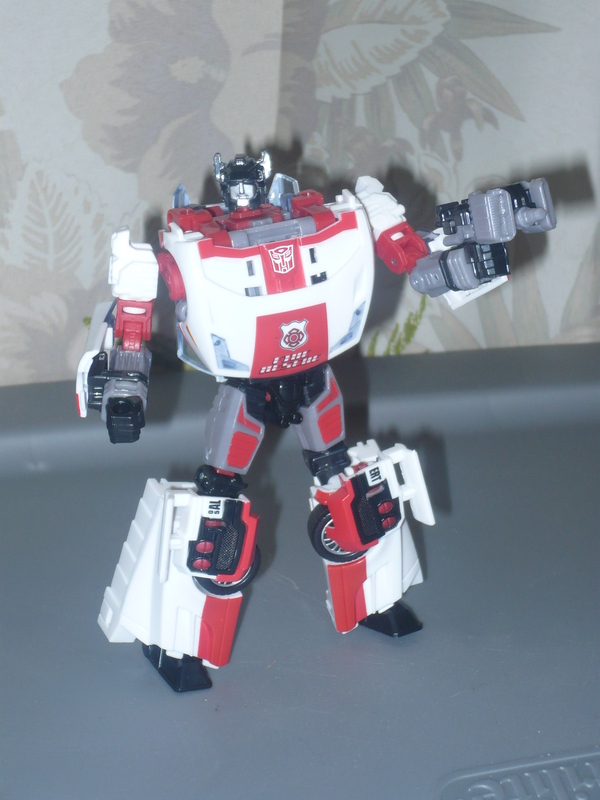 Like a handful of figures from this line, Red Alert is a nod to his G1 counterpart. 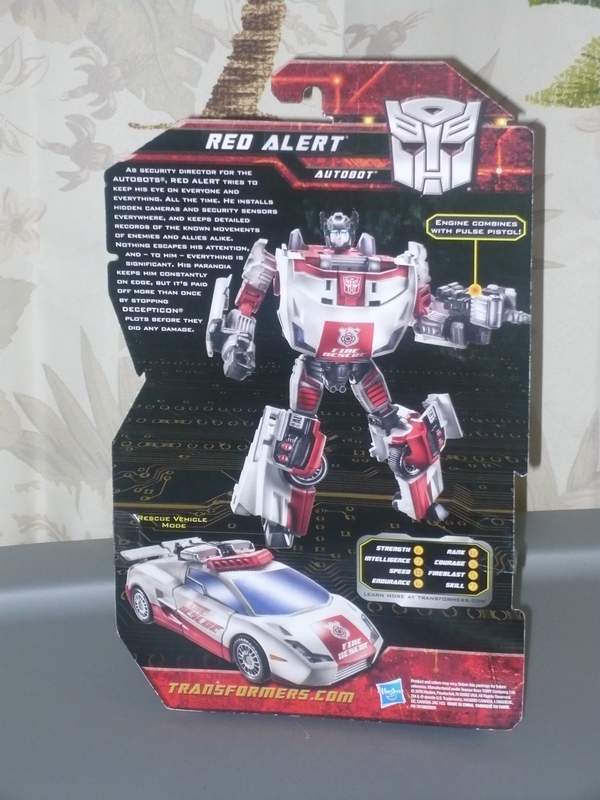 Due to licensing issues, Red Alert had to be modified just enough to not be a Lamborghini(still looks like one to me). He now sports Fire Rescue, instead of Fire Chief. 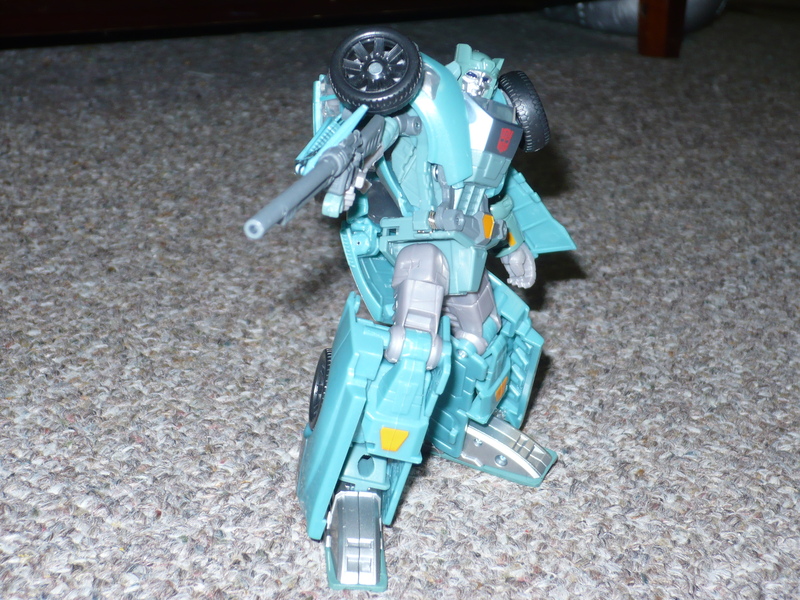 He looks good here, but you know me…I’m all about the robot mode. And this is another one that does not disappoint! 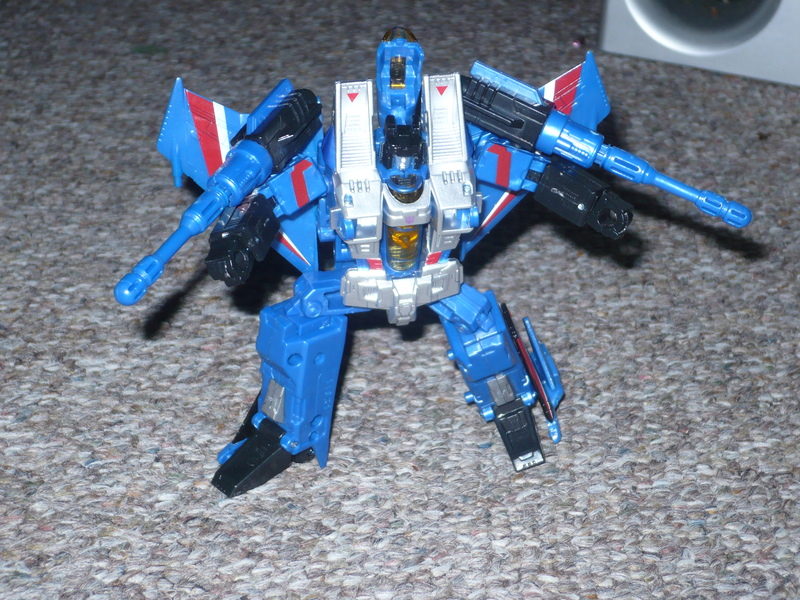 In my opinion Hasbro is making the figures they couldn’t make 20+ years ago(don’t get me wrong, I love the G1 figures). 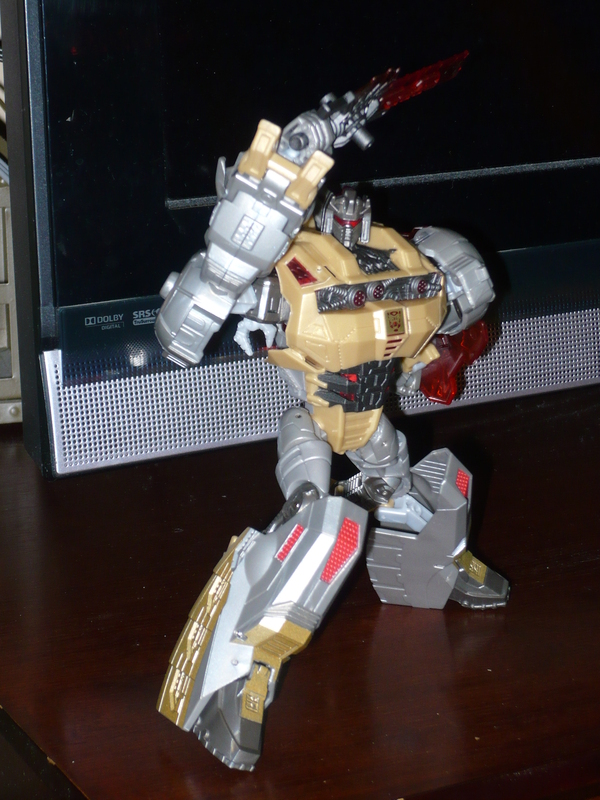 If these figures were made of die-cast metal, they would be perfect. 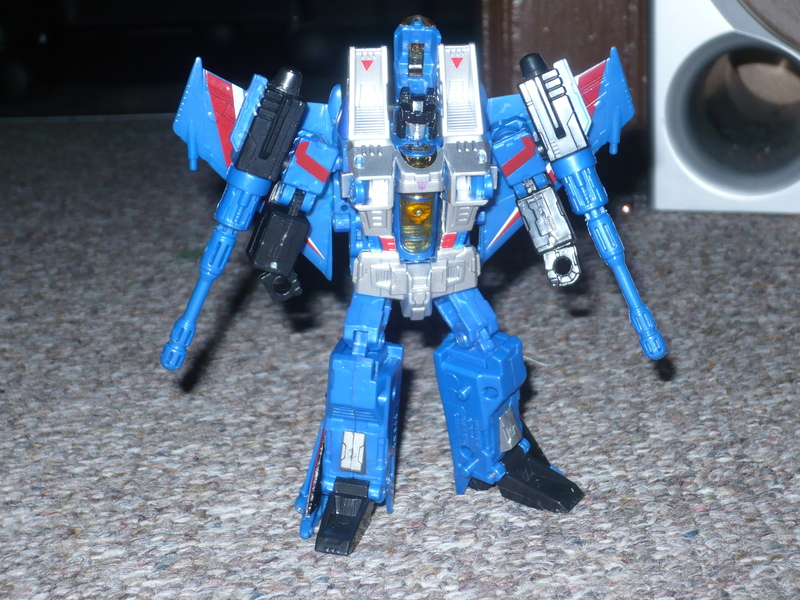 My only gripe has to do with the accessories. 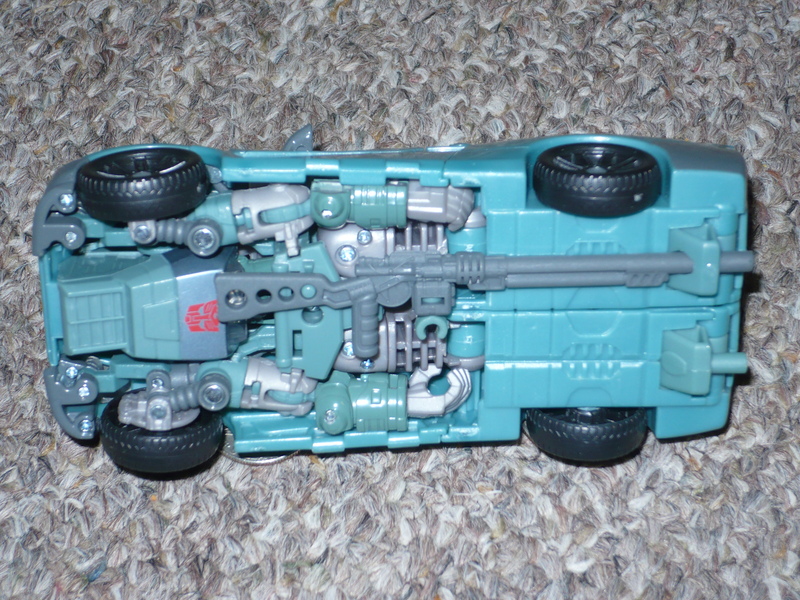 The engine that sits on top in vehicle mode, is supposed to attach to his blaster in robot mode. The problem is that, at least being the case with mine, is that they will not stay together. This knocks a point off of it’s perfect score. 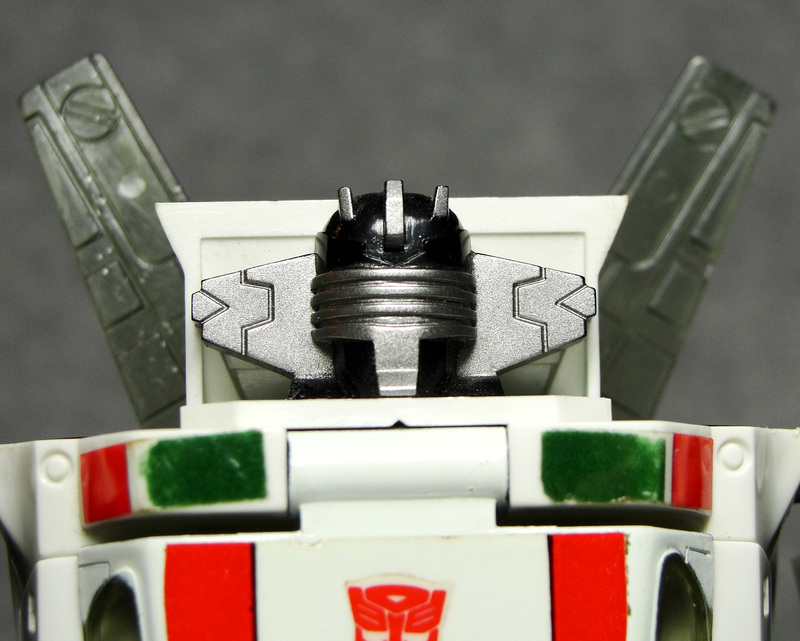 But looking at the head sculpt negates this, I guess. 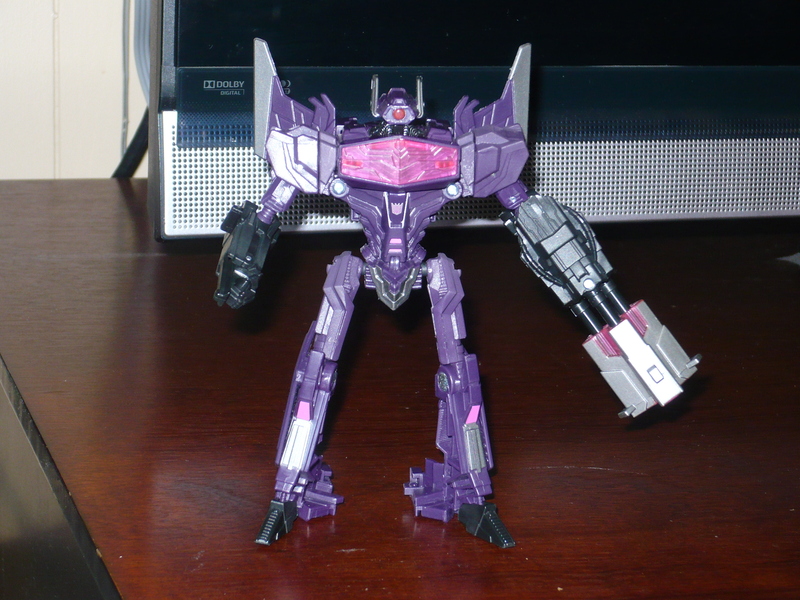 I would give this figure my recommendation. 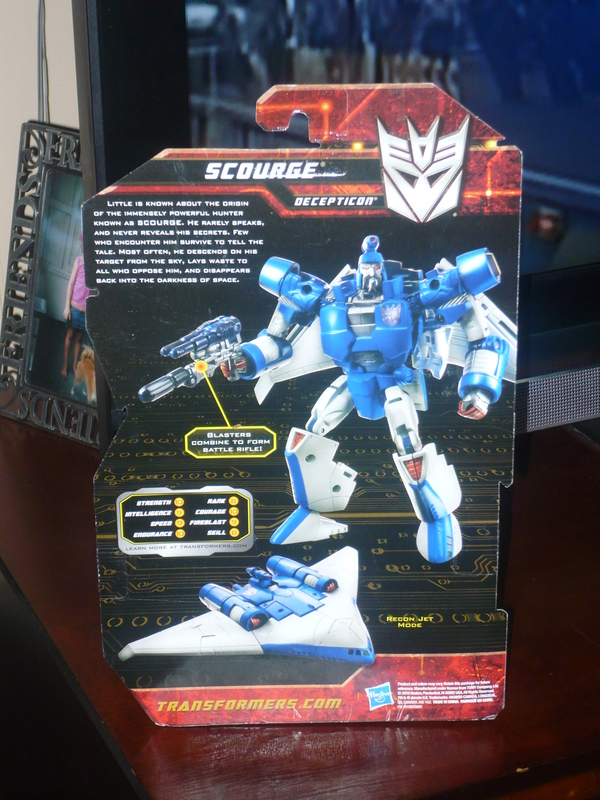 I have 5 more Transformers lined up. waiting for review. I don’t know if I’ll review them all(I might keep them stored until I have more room), but 3 of them will find their way on here in the near future. Here’s a little clue to who’s next. 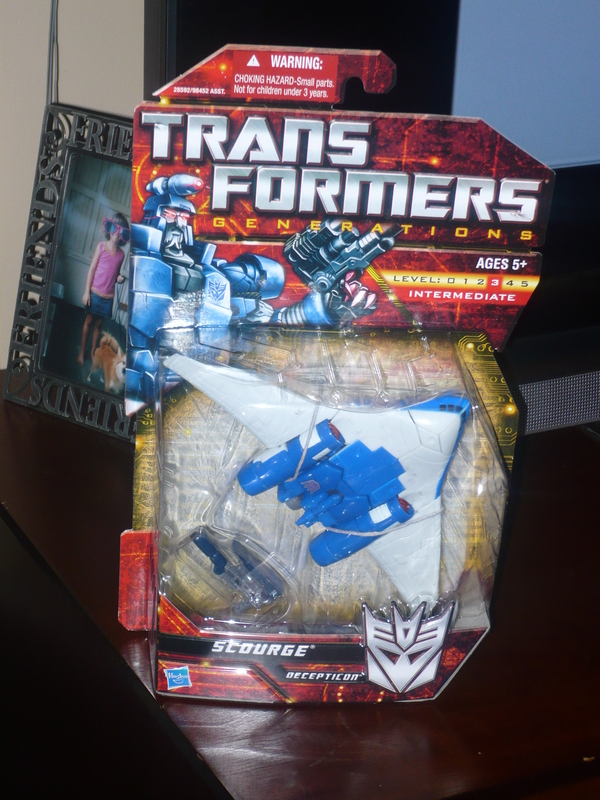 At the very same Wal-mart that I found Wheeljack, I also found this awesome Decepticon(during the same visit). 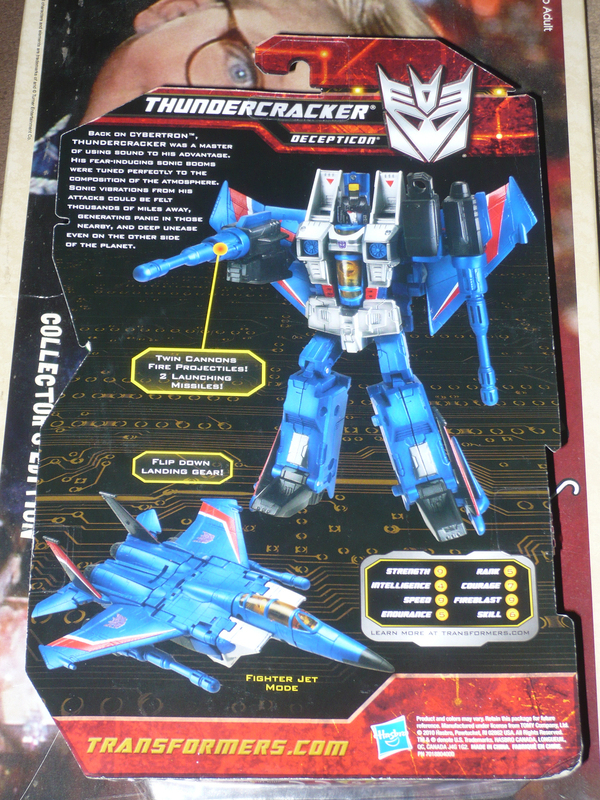 Thundercracker, along with Starscream and Skywarp, were the original 3 seeker jets in the original Transformers series. 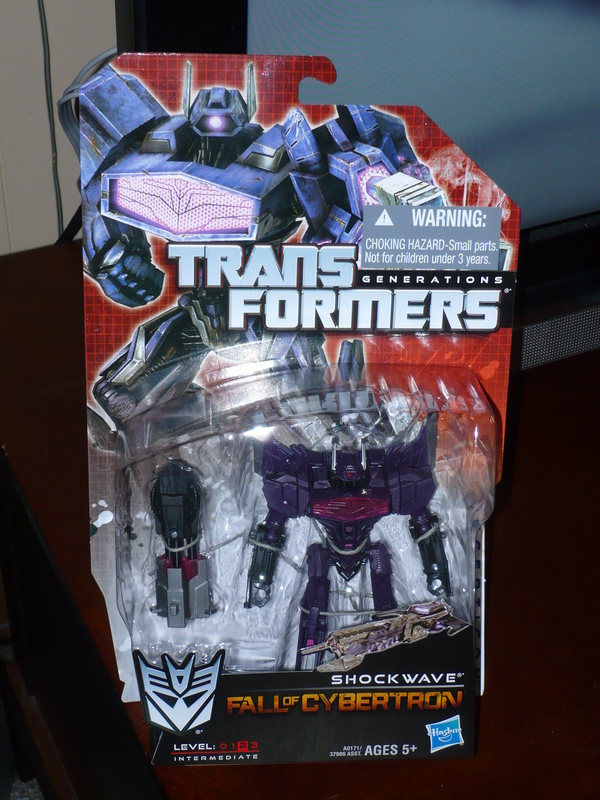 I was surprised to see the 2 figures I wanted in this wave at the same store at the same time. I wasted no time in grabbing both of them. 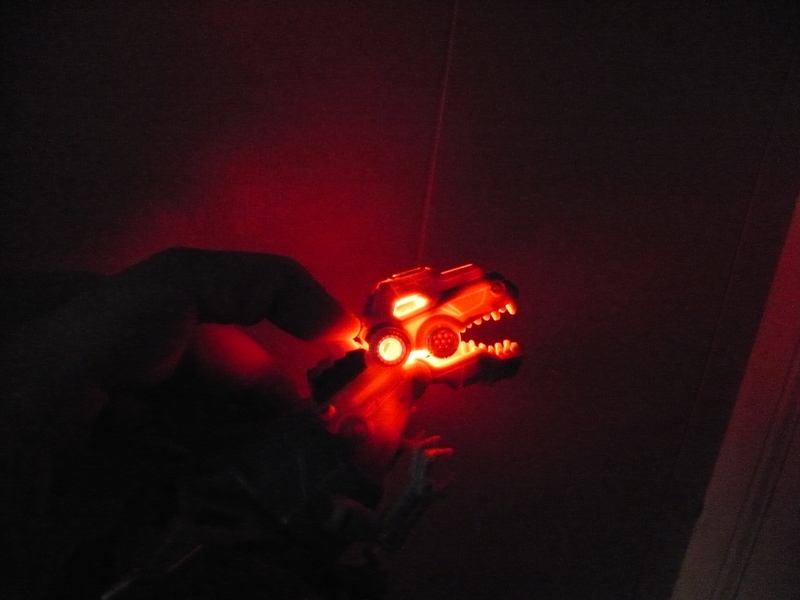 It’s hard to beleive that there were actually 3 of these on the pegs! 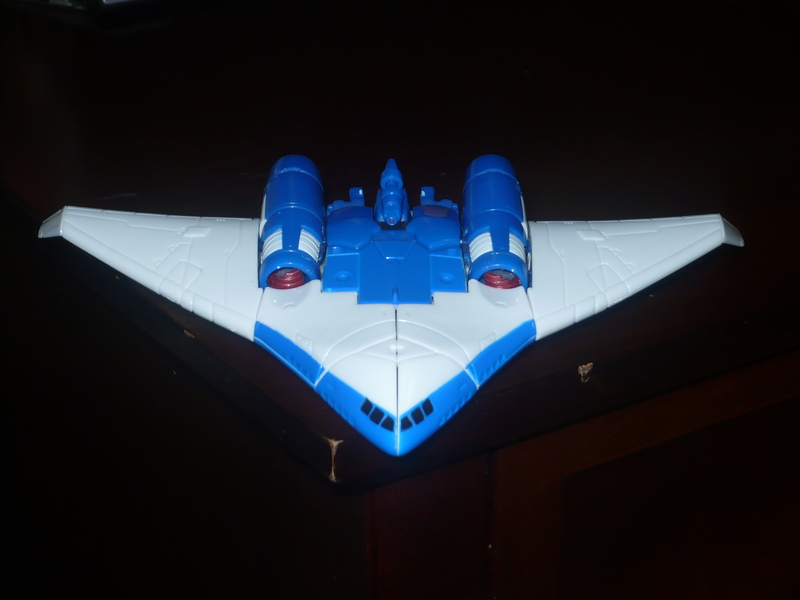 First, we’ll take a look at the seeker mode. 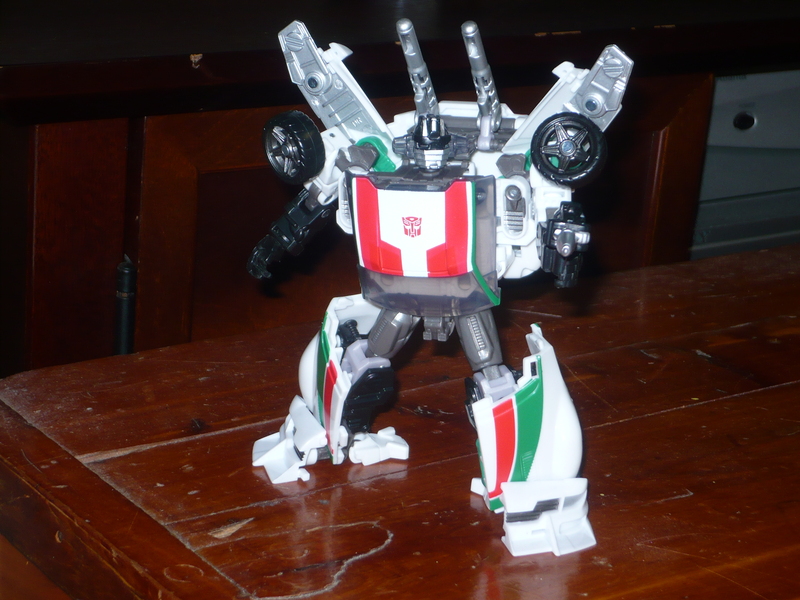 I think my fascination with this line has to do with how much they are a tribute to the G1 Transformers. The colors really pop here. 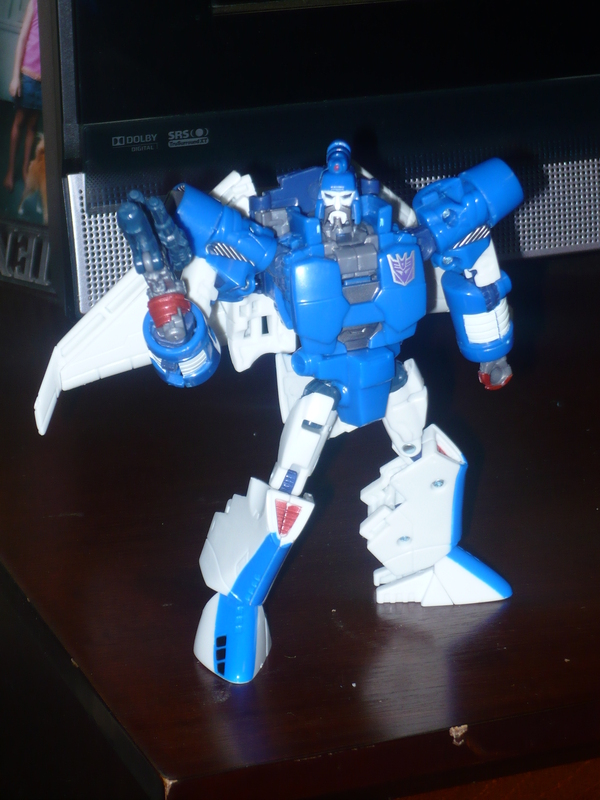 I find it amazing that the figures look this good, but are still able to evoke the nostalgia of the originals. 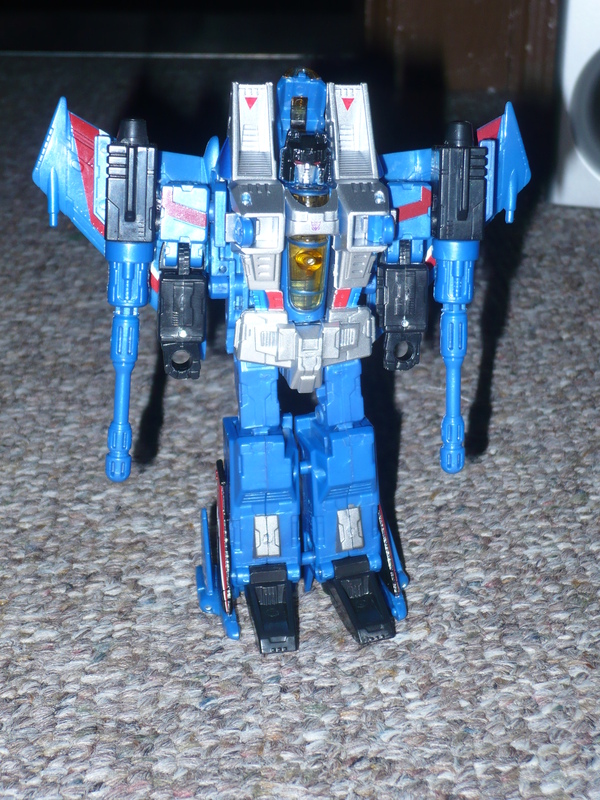 This was another figure I never owned as a kid(back then, I probably would’ve preferred Starscream), and it seems the ones I never owned are the ones that appeal to me the most. 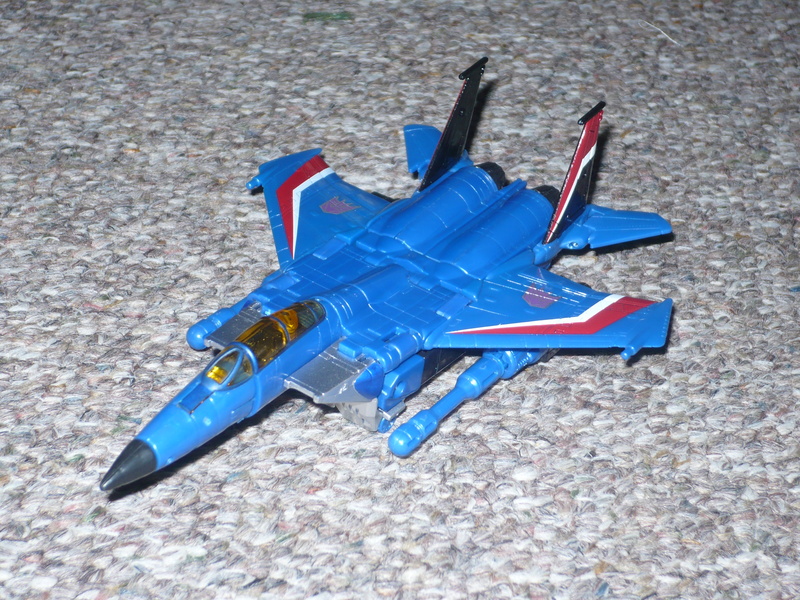 If they release a Starscream and/or a Skywarp, I would get both, even though they would just be repaints. 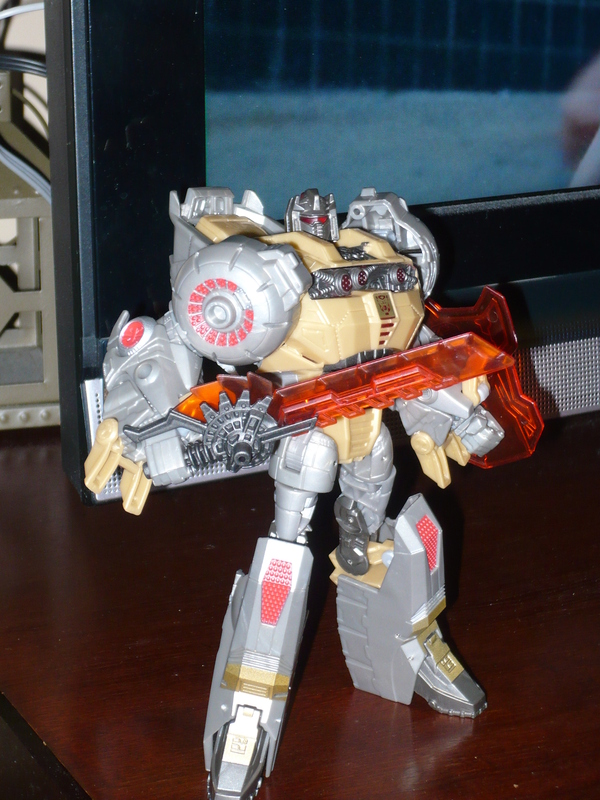 And of course, he looks great in robot mode as well. I have to say that I am very pleased with this purchase. 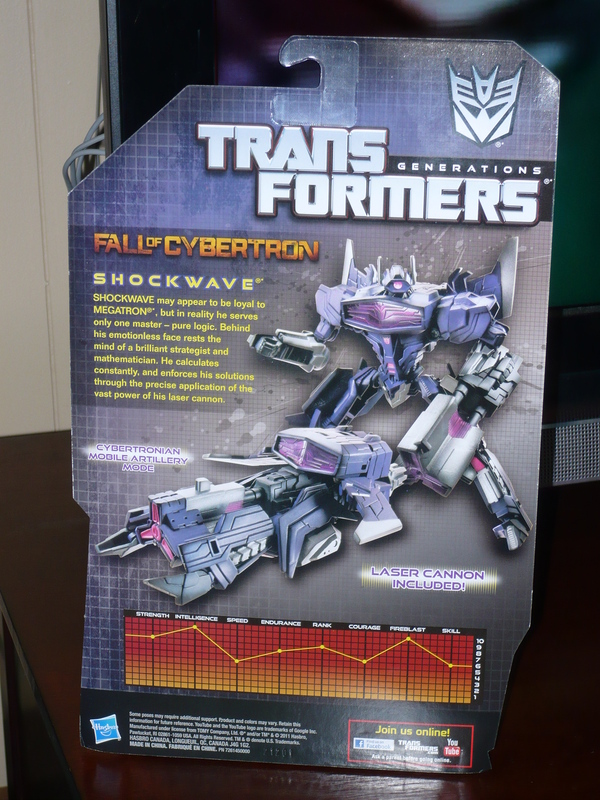 I can only hope that Hasbro continues to make these great figures(in my opinion, the movie ones just don’t have the “wow” factor). This definitely gets my reccomendation, and another 10 out 0f 10. I will be leaving for vacation tomorrow afternoon and won’t be back until Tuesday. So I want to take this time to say have a happy and safe Independence Day, and remember all those who have fought and those who have sacrificed themselves to keep our wonderful nation free. While this weekend wasn’t all that great for yard/garage-saling, it was a nice end to an awesome week. Earlier this week, a co-worker brought me this. On a break at work, we had gotten on the topic of video games. Long story short, I was given what you see above. 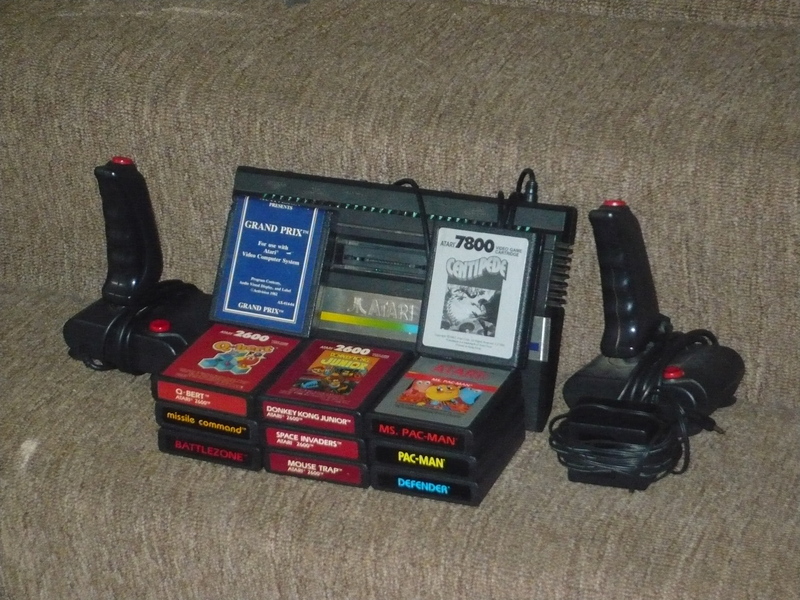 It’s an Atari 2600, 2 joysticks(I know they’re not the original ones), and 11 games. The games are, Grand Prix, Centipede, Q-Bert, Donkey Kong Jr., Ms. Pac-Man, Missile Command, Space Invaders, Pac-Man, Battlezone, Mouse Trap and Defender. 90% of the games are classics! We’ve been doing some cleaning out and rearranging stuff at my place, so I haven’t been able to play any of them yet. 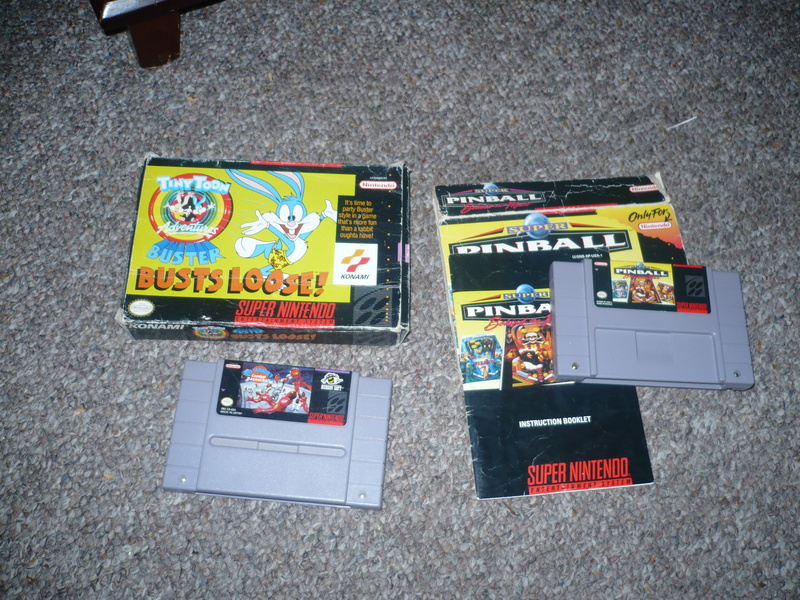 I’m looking forward to playing the god-awful Pac-Man port for this system. The Atari 2600 was the first home console I had ever played. It’s reign came to an end when the NES came into my life somewhere around 1985-86. Yesterday we decided to hit the road and look for garage sales. There were a few quick showers in the early afternoon, and that may have been why we didn’t see many sales. At the sales we were able to find, the wares were plentiful, but of no interest to me. The upside was, I didn’t spend much. Everything pictured came to a grand total of $2.25. 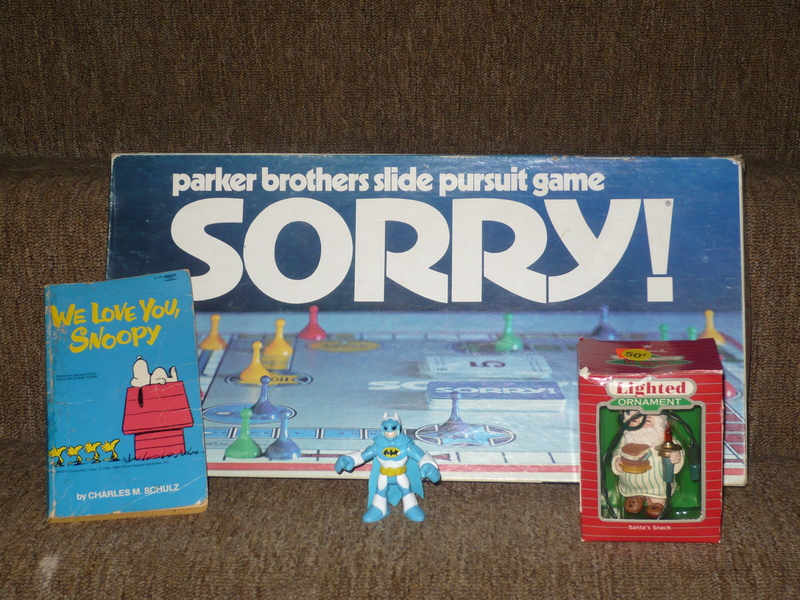 I bought Sorry! for a few reasons. I don’t know how old the one I had growing up was, but this one (1972) looks just like it. And secondly because it’s a fun game to play. The Snoopy book was 50 cents, but it’s classic Snoopy. I found the awesome little Batman at a church sale for 25 cents! 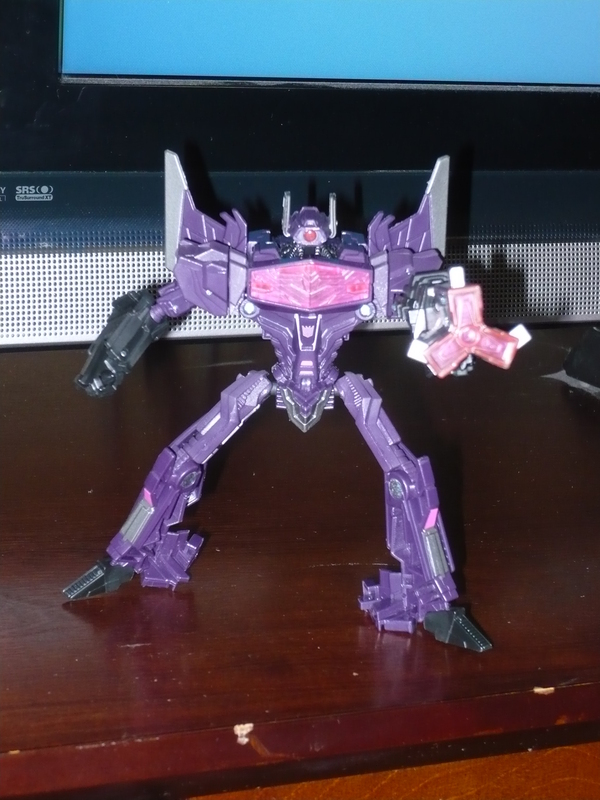 The colors look great, the sculpt is fun, and best of all, he has a cloth cape! The Santa Clause is a Hallmark Holiday Magic ornament that plugs into a light strand an lights up. 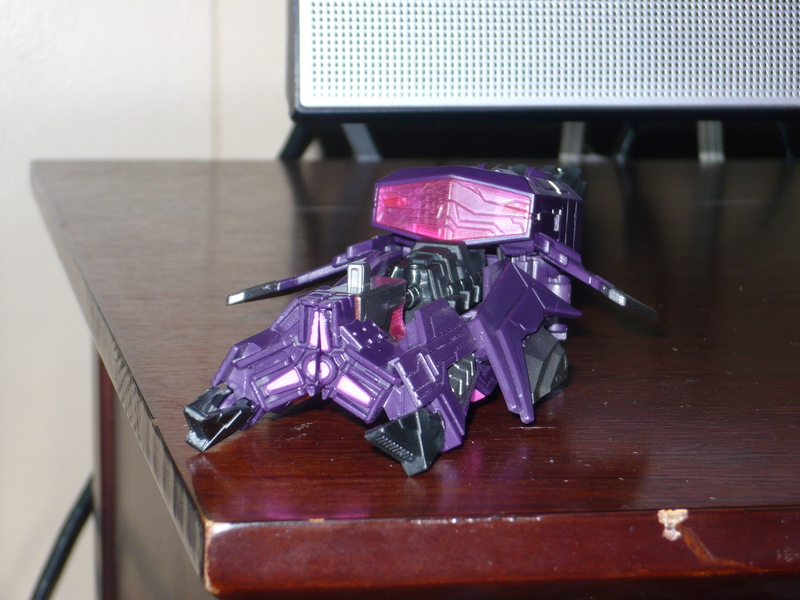 It looks pretty neat, and if it works, the 50 cents I paid was a hell of a deal! 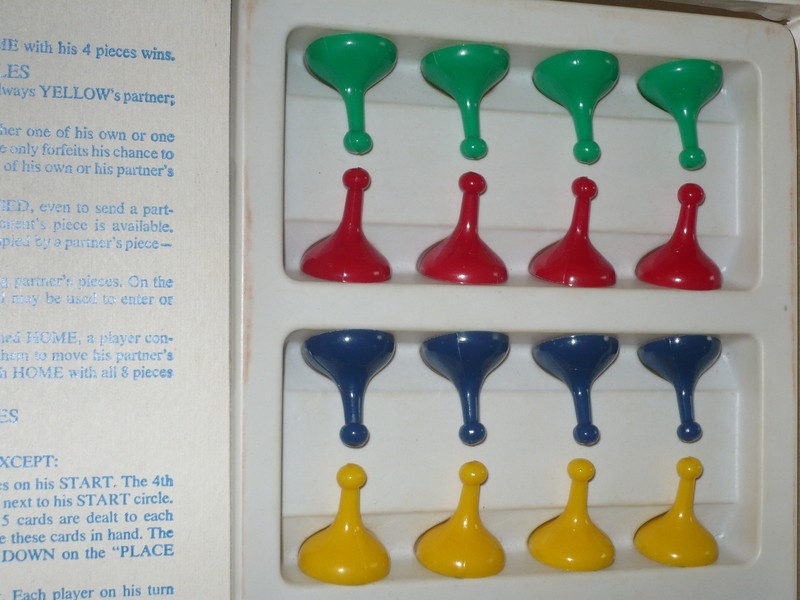 There’s one other thing I want to mention about Sorry!, and that is that this particular ones game tokens look like they’ve barely been used. What really sealed the deal of this being an awesome week, is what we’ll be looking at next. It’s been said that good things come to those who wait. I’ve been really patient. And that patience finally paid off! Our plan for yesterday was to look for garage sales in areas that are a little further from where we live. Going outside of our local area adds a newness to the hunt. Different people with different stuff. While the area was new to us for yard sales, we were familiar with the area. 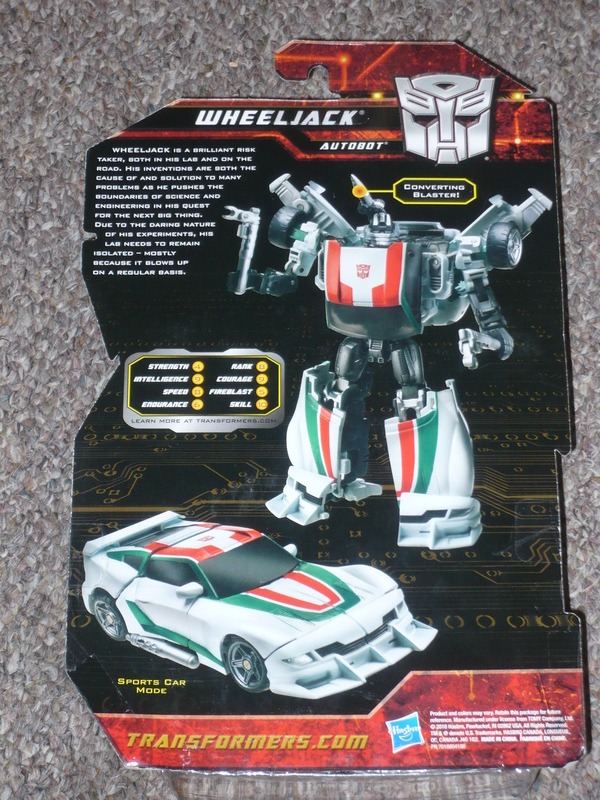 I found Wheeljack in this area’s Wal-Mart. I wish my local Wal-Mart had the toy selection I saw yesterday. I will be making subsequent trips to this store. 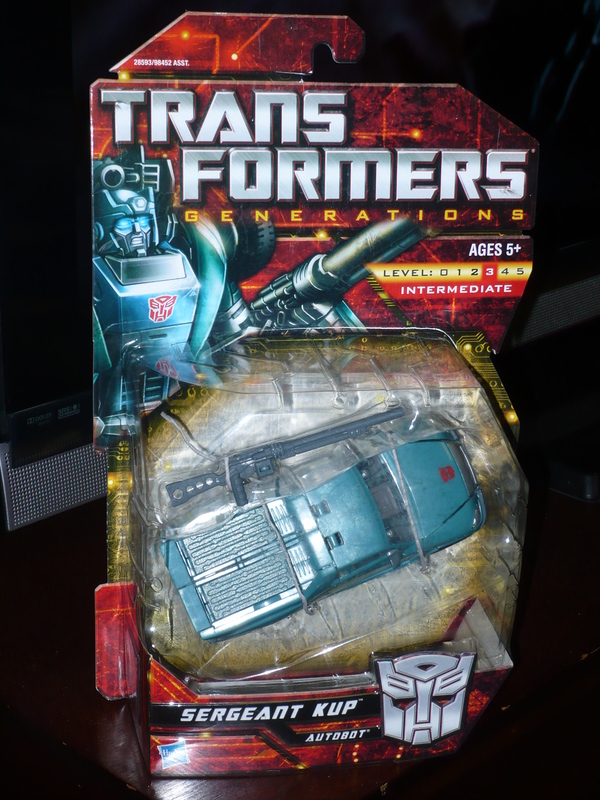 There was an incredible selection of Transformers, and there were 2 of these left. 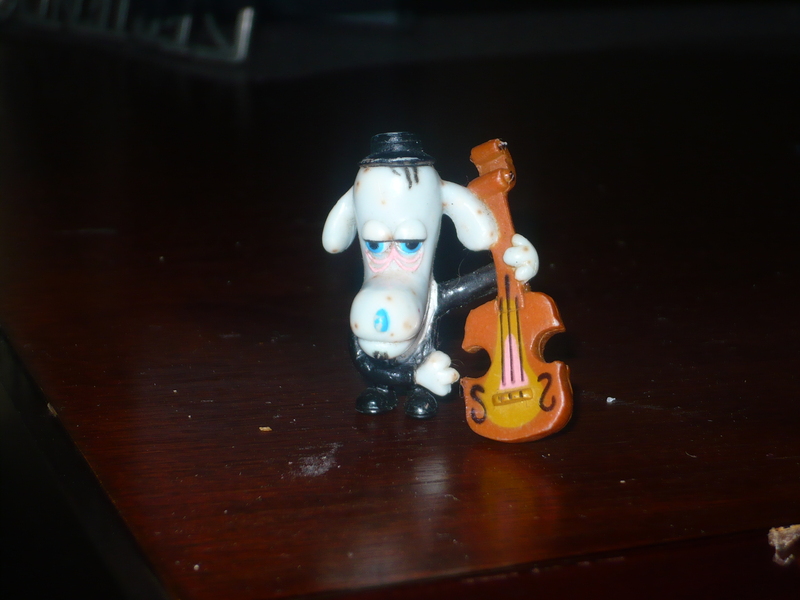 I have been looking for this figure for months! 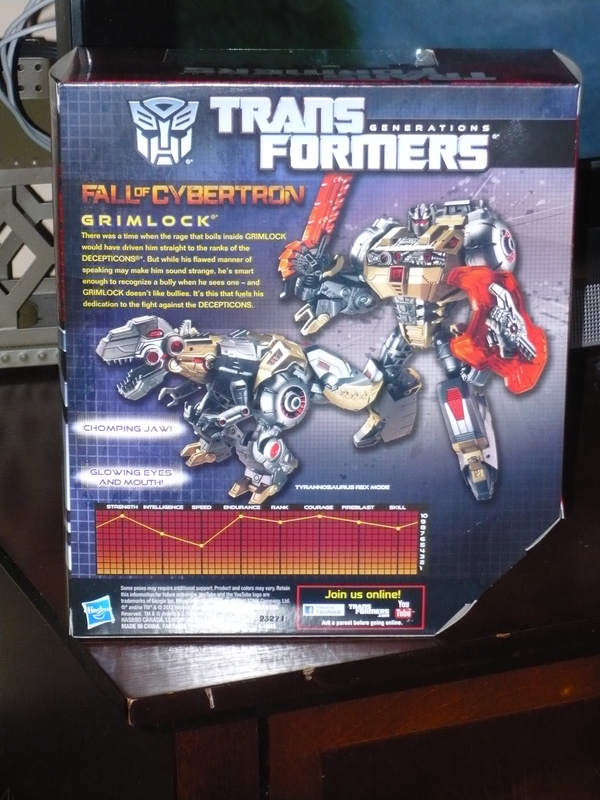 I checked many stores with no luck. 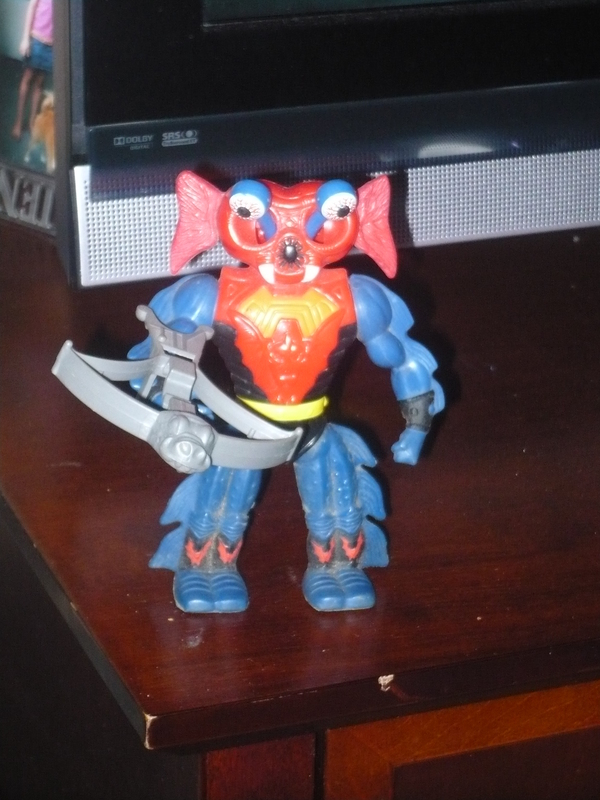 On Amazon and Ebay, this guy is selling for over $25.00! 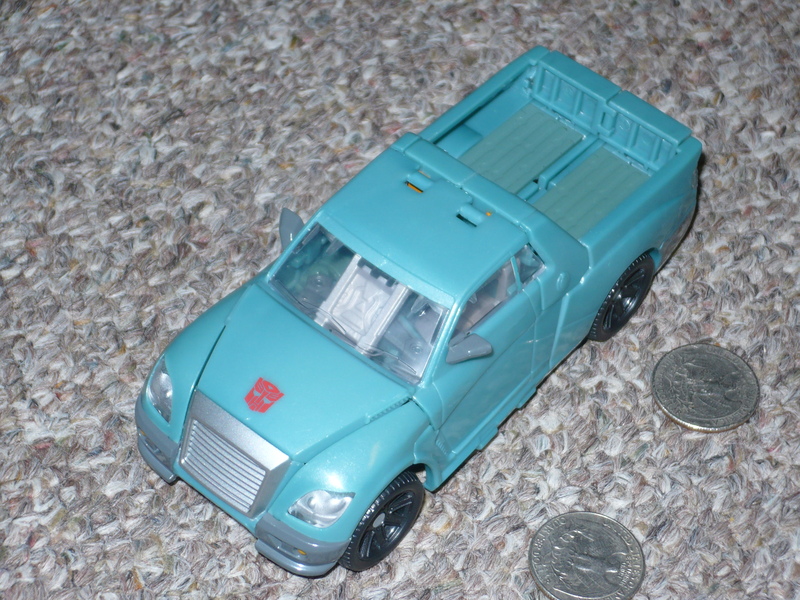 That’s ridiculous for a new toy, and I refuse to pay an inflated price for an imaginary premium. 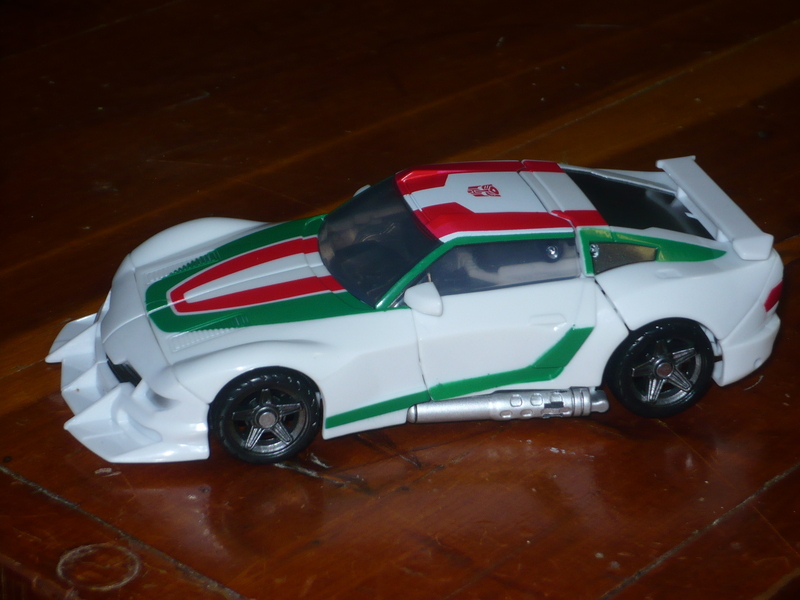 The head sculpt looks better than the G1 Wheeljack, and the body of the alt-mode had to be modified for legal reasons. 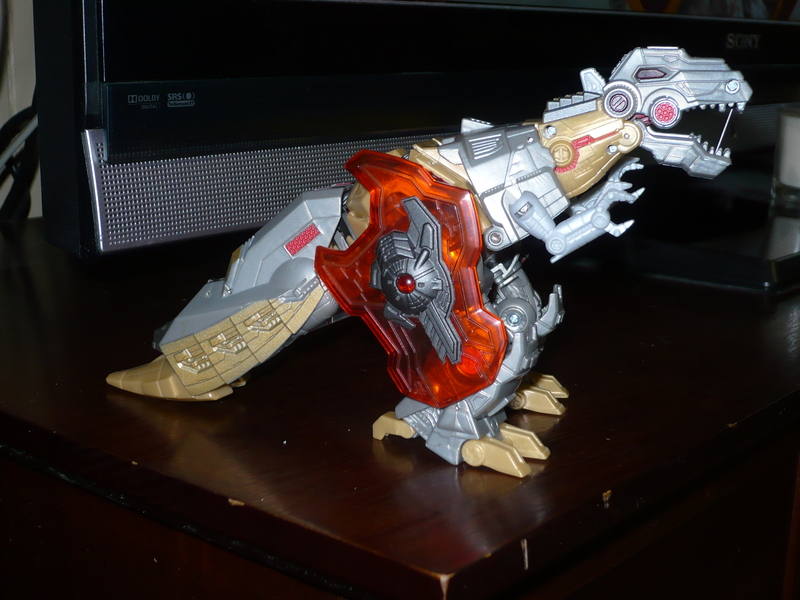 Still, it looks great, and is my favorite in the Generations line thus far. 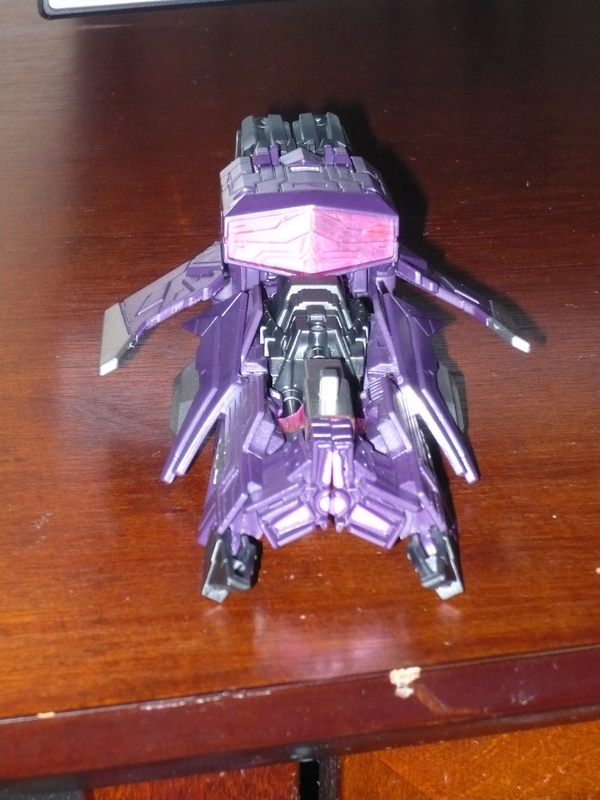 The funny thing is that the instructions were actually helpful with the transformation(this is a first). 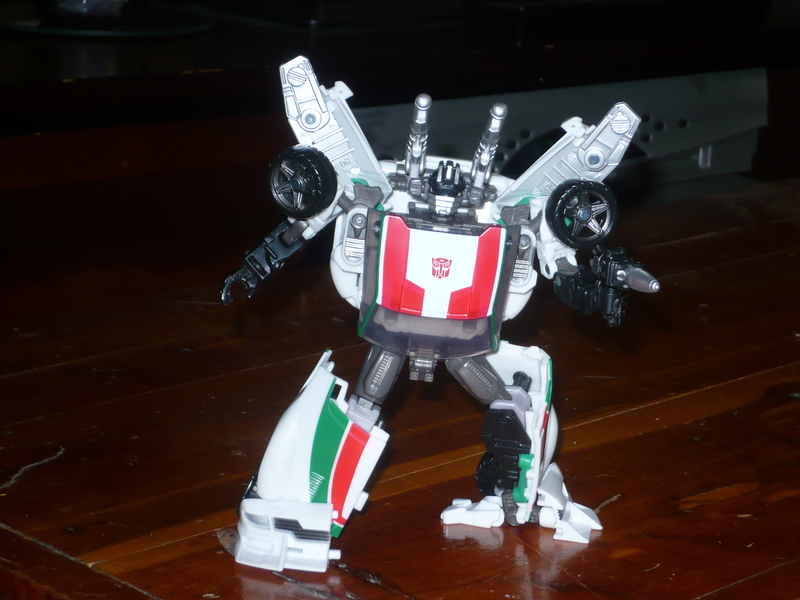 Wheeljack looks great in either mode. 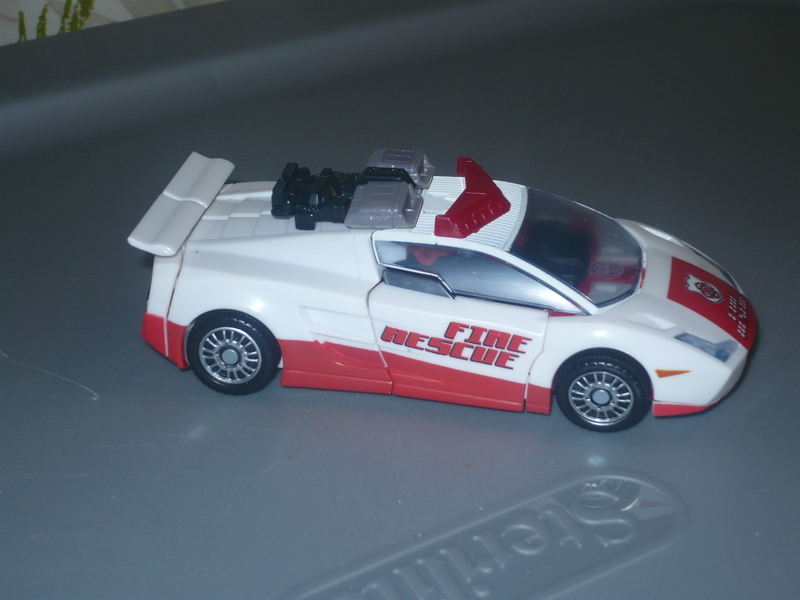 His car design is sporty and sleek. It looks just as nice as the original. 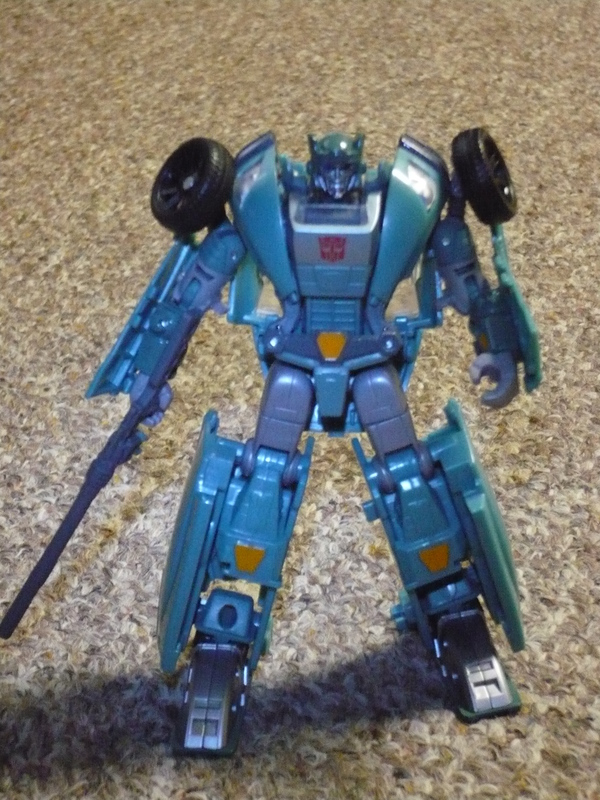 In robot mode, the head sculpt looks exactly like he did in the G1 cartoon. 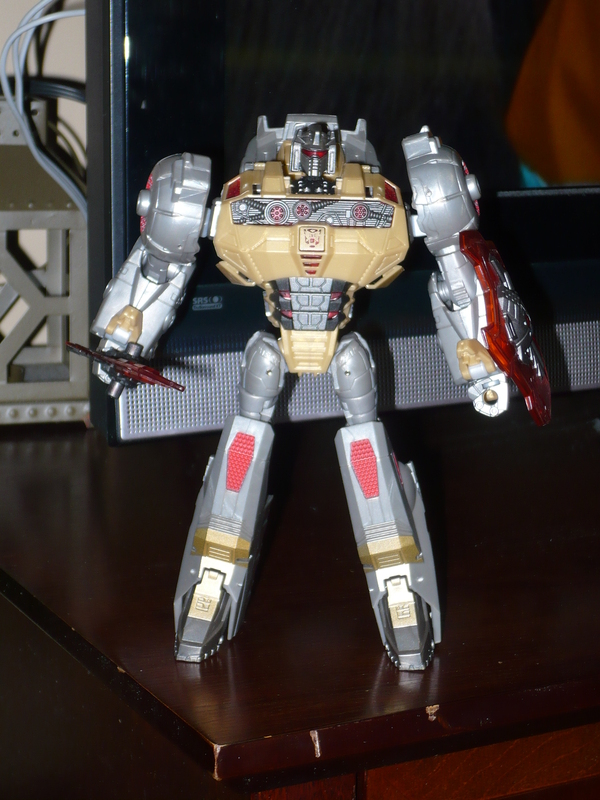 His G1 counterpart is a great toy, but the head just isn’t right. This one improves on the original, without taking away anything. 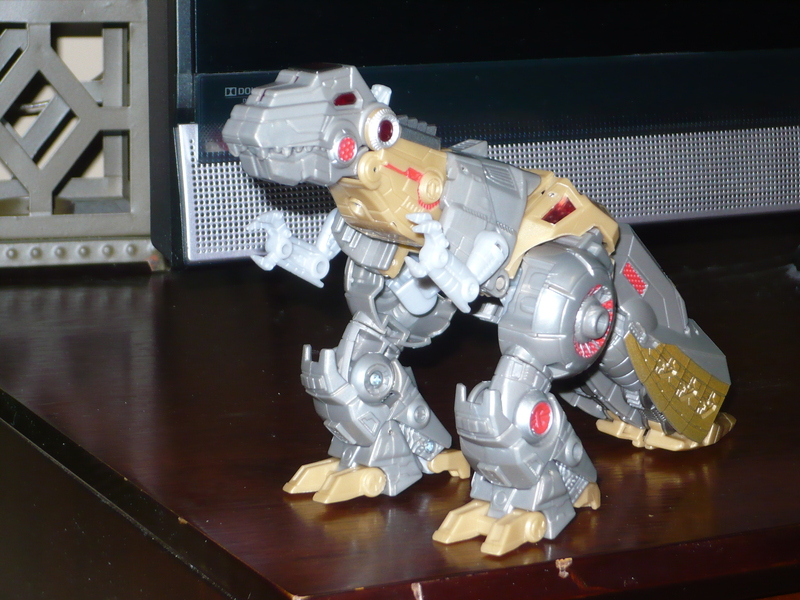 Even though I got him after almost everyone else did, I’m still happy to own this. This gets a 10 out of 10 in my book. 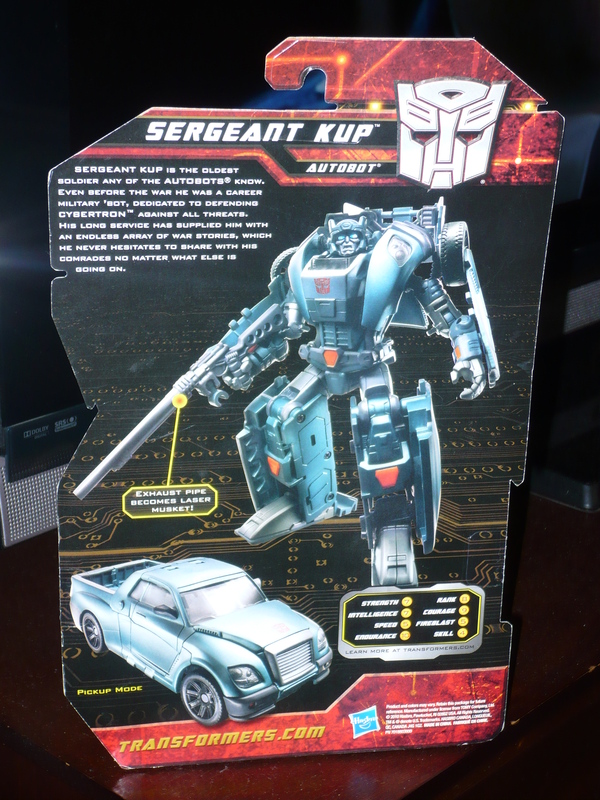 Congrats to Hasbro, for getting this one right! I have some great stuff in the pipeline, and if I can learn how update a little less erratically, we’ll see see it in the coming days. Wish me luck!